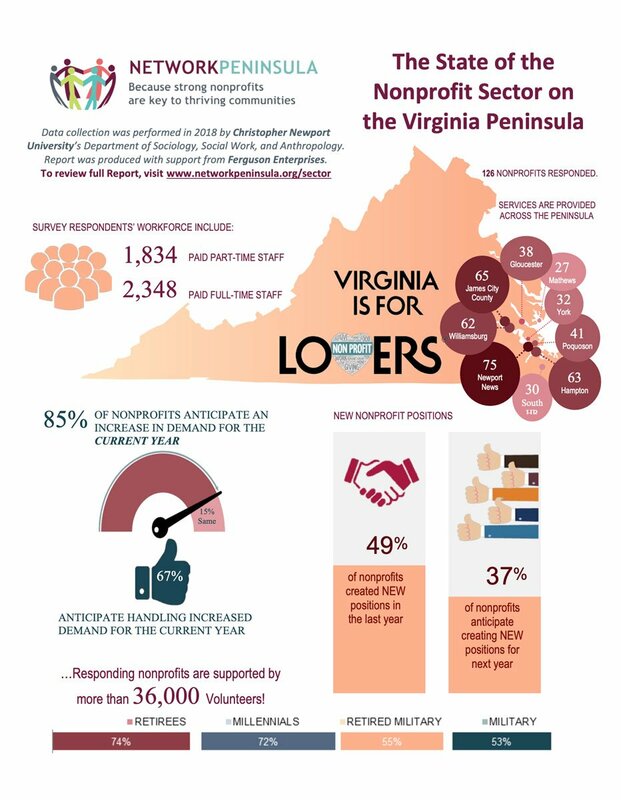 This Inaugural Report was produced in December 2018 to shine a light on the value of the nonprofit sector, not only to the health and well being of our communities but also to the local economy. We are very thankful to the 126 nonprofits that responded to our survey and grateful for the important work they do every day. Data collection was provided by Christopher Newport University’s Department of Sociology, Social Work, and Anthropology. Data were collected in the first quarter of 2018. Responses were based on the organizations’ current fiscal year, or most recent completed fiscal year where applicable. This Inaugural Report was underwritten with support from Ferguson Enterprises. To review the Report in its entirety, CLICK HERE. For all Infographics providing an overview of the Report, CLICK HERE.